1. Your ability to make eye contact suffers. 58 percent of millennials experience some form of anxiety if they aren’t able to check their phone. In fact, millennials check their phones up to 150 times a day as a result of the dopamine that gets released in the brain when they receive a text message or get likes on a social media post. With that sort of an addiction, it’s not surprising not to be able to sustain eye contact. The discomfort experienced when forced to separate from their device is real. Unfortunately, being able to make eye contact is what helps establish not only a connection but also trust with another person. This could have a devastating impact on your professional life. While focusing on the need to make eye contact can create some awkward moments, it’s important to be aware that this might be a potential problem. Try going to dinner with a friend and keep your phone off the table. Test yourself to see if you can make it through the meal without checking your phone! Here’s why it’s so important…. 2. You’re shying away from face-to-face conversations. A recent study showed that in person meetings are 34 times more successful than email. Naturally, eye contact will be an important part of a face-to-face meeting. To make the meeting as successful as possible, keep your digital device off the table. 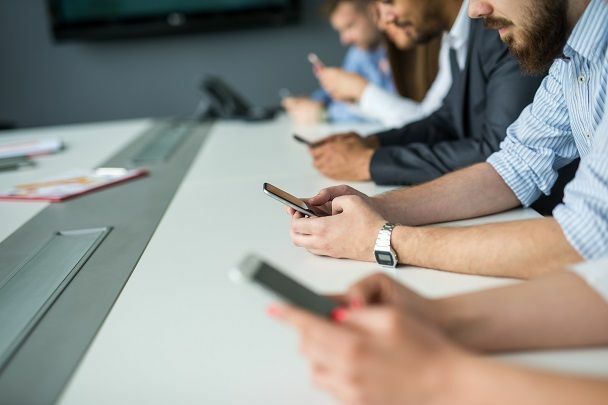 As just about everyone has become tethered to their mobile devices these days, it’s hard to imagine going into a meeting without having your device handy. But unless you are expecting important information that will impact the outcome of your meeting, there’s no need to check it until the meeting is over. Checking your device takes your focus away from the topic at hand. It also sends a message to the person you’re meeting with that they are not worthy of your full attention. 3. You’re less comfortable with nondigital conversations. When most of your communications are virtual, two things happen. One, you are in a constant state of control. You can edit and tweak your message until you’re ready to hit send. This pattern of communication makes it hard to let your guard down. Vulnerability with someone in real time can start to feel very foreign. While you might not think that vulnerability is required in the workplace, it’s actually one of the traits that can help you become a better boss and leader. 4. You’re shielding yourself from both conflict and conflict resolution. Millennials avoid phone calls. Why? They’re less likely to experience conflict. Instead, they use text messages. In the age of swiping right or left, many things, even relationships can be disposable. Often there’s no need for conversation or explanation. This tendency has shown that conflict resolution skills are lacking in younger generations and could impact the ability to handle conflict in the workplace as a result. There’s no doubt that millennials and technology in the workplace are a driving change. While these are a few things to be aware of, much of the change is positive. Like anything, being aware of the drawbacks only puts you in a position to be able to overcome them. Feeling consumed by the digital world? It’s time to commit to a much needed break. Try our digital detox and reap the benefits.